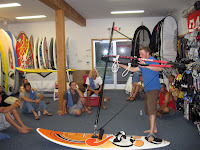 Tonight, Sailworld hosted the Hatteras Loop Fest Loop Clinic. Andy McKinney provided participants with valuable knowledge and tips regarding making the initial commit and executing a successful first forward loop. We had an excellent turnout for the event, and everyone is pumped and "Ready to Rotate!" There were also a number of sponsor prizes for registered participants including t-shirts, rash guards, and other cool stuff. 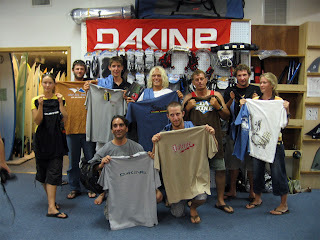 George Markopoulos from Maryland took home the Loop Clinic grand prize which was a new Dakine T3 waist harness! The latest iWindsurf forecast looks promising for the first part of the upcoming week. Hopefully, the past week and a half of windless weather is about to end, and for Hatteras Loop Fest, we will have perfect conditions to go for a spin this coming week! Stay tuned! Loop Clinic participants display their winnings! Windsurfing is great anywhere where proper condition allow you to enjoy, but there is no other place like the Hatteras Loop. I'm going to have to agree whole-heartedly with genital warts on this one, Bill. Grate to see progressive attitudes. May 2008 Wrap Up and LoopFest News! Couple of BIG SW Wind Days!